Apples and Snakes has over 30 years experience in developing participatory workshops and performances that provide real benefits, both for those who attend and the wider community. Spoken word and performance poetry as an artform is brilliantly versatile. 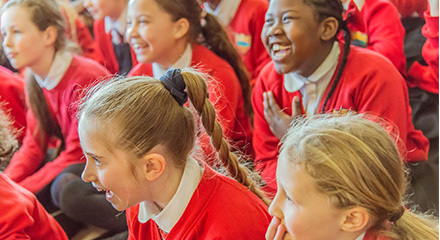 It can be used to highlight community issues, aid understanding of poetry and develop life skills that help build resilience across all age groups and abilities. Please read these testimonials from previous bookers and attenders to see how our work can engage and inspire across all sections of the community. Enquiries? Interested in talking to us about developing a participatory workshop or spoken word performance for your school, hospital, other community venue, a private party or corporate event? Please complete our online enquiry form with as much detail as possible and we will contact you to discuss your specific needs, and help you to choose the best artist possible for your event! Our standard fees for artists are £215 per half day (up to 2 hours total delivery time) or £335 for a full day (up to 4 hours total delivery time). These timings can be stretched to a full school day for example, so long as the artist has enough breaks in between and is happy with the terms of the booking. Some of our artists do charge slightly more than the standard fee and while we do our best to find a suitable local artist for each event this is not always possible and for certain bookings we may need to add the artists' travel costs to the overall booking fees shown above. Any additional charges will be discussed with you in depth before any booking is confirmed.